I like Christmas and the excuse to dress up the house in its party clothes. This year it all seemed like work I had to do instead of work I wanted to do because Husband and I are feeling the loss of the biggest Christmas lover of all - Blitzkrieg. Blitzkrieg didn't know anything about oil lamps burning longer than they should, or a baby being born in a barn, or if a special hunk of tree is burning in the fireplace. All he knew is when I brought certain boxes and tubs in from the garage (Blitzkrieg knew the difference. I moved some tubs into the house when cleaning the garage one summer. 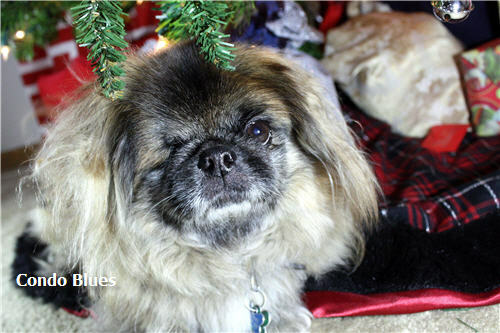 Blitzkrieg got excited and did the Pekingese Dance only when he saw me move the Christmas tree box into the house during the project), the Christmas tree was going up with a special soft blanket underneath to sit on. The Pack Leaders put things under the tree (but not in the special space we eventually left for Blitzkrieg to sit under the tree.) Then a special day comes when the humans divide the spoils to the pack and you go to bed with a belly full of homemade dried sweet potato treats. Blitzkrieg photo bombing by cloth gift bag tutorial post. Yeah, so basically, if you have a pet that clues in about the holidays, their understanding is all on a purely materialistic level despite your best efforts. Our spur of the moment Michigan vacation was the thing I needed to work through the rest of the anxiety, sadness, and quick to crankiness that hasn't gone away since Blitzkrieg passed. We ate clever cheeses. Husband and I laughed and joked like we haven't done in a long time. 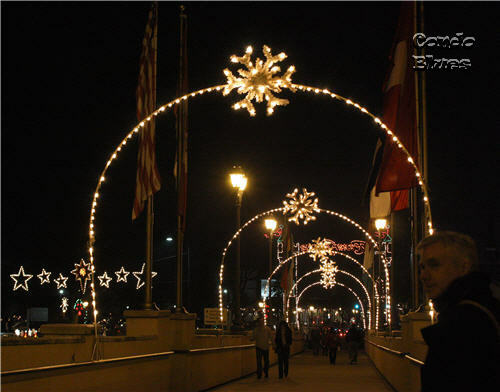 We saw Chritmas lights! Christmas lights make me happy. I found my happy place. I got some Christmas decorating inspiration. The day after we got home, I happily hauled the Christmas tree and decorations from the garage. I like to mix and switch up my Christmas decor to make what I already have look new and interesting although we have favorites we put out every year. I don't put out all of the Christmas decorations we have either. This keeps things from looking too cluttered and also helps to make old things we haven't seen in awhile new. Our vacation inspired me to do a ye olde glammy tree. For most people that means Victorian (where historically we get the Christmas tree tradition.) In our house ye olde means Renaissance. Welcome to my gold, silver, and burgundy Renaissance Christmas tree! I finally got the gold ribbon and silver bead and bell garland to look right. This year I put it on the tree first instead of last. It makes all the difference. I'm having a little tree topper fatigue and want a change. 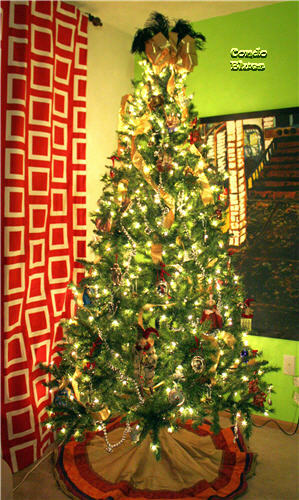 I took my inspiration from the Skittles tree in my 7 Dazzling Christmas Trees post. 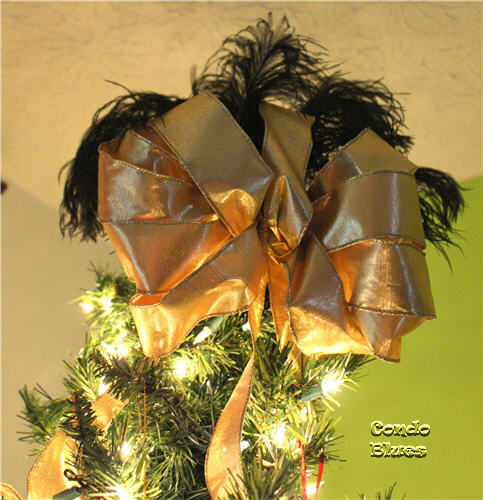 I made a tree topper bow from wired ribbon. I stuck some feathers I have left from costuming behind the ribbon to give the bow a little something extra. I used the angel tree topper to decorate a table in another part of the living room. The Renaissance is where our story began. Husband and I met as Renaissance festival performers. He invited our friends in the cast to participate in our proposal. We married in a Renaissance theme wedding. As we started our family's Christmas tree ornament collection, we bought ornaments that reminded us of characters we played, bits we did, and from places that hold special meaning. 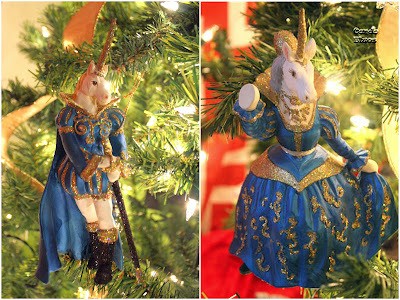 Paper mache unicorns in Elizabethan clothing. I got a new Elizabethan animal ornament every year for several Christmases until I collected the set. 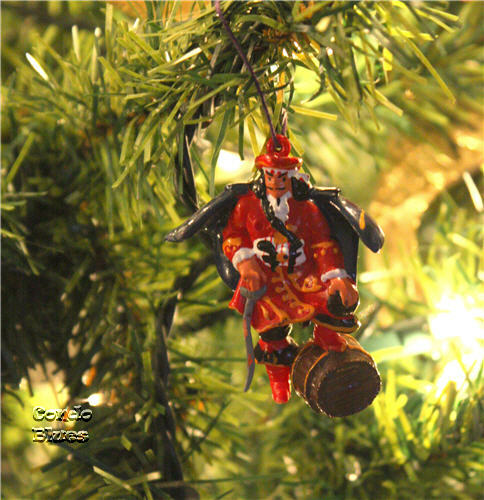 We have many jester ornaments since my first character was a jester. The martini shaker and crystal martini glass represent how Husband and I based our Lord Mayor and Lady Mayoress characters on Nick and Nora Charles from the Thin Man movies. And are an excuse to shop the Lenox outlet. 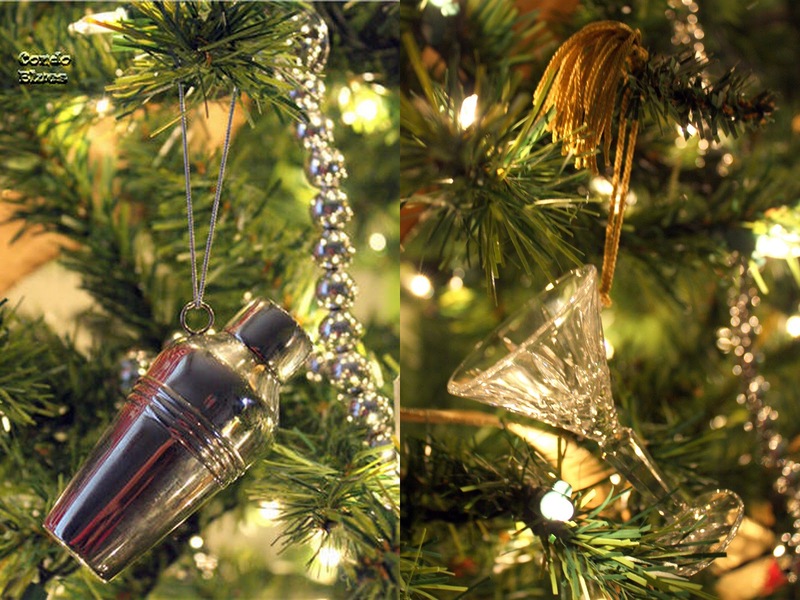 Not all of our tree is fine silver and crystal ornaments. 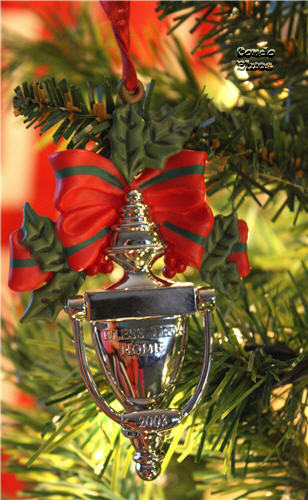 We have that quirky high end low end thing we do on our Christmas tree too. We found Captain Morgan under our car in a parking lot. I added a string and he's been hanging around ever since. Some people do the Christmas pickle. We do the Christmas pirate. 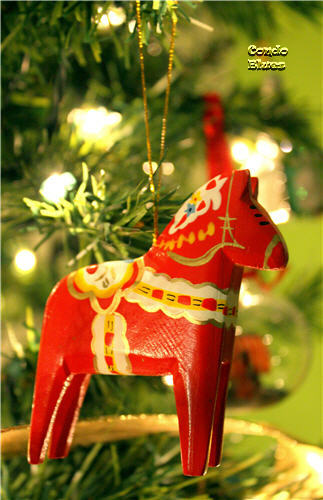 We have some nonRenaissance themed ornaments on our tree such as my Swedish Dala horse. And to commemorate special events like Our First House. We spent the first Christmas in our new home in the dark during a week long ice storm blackout. I can't find an ornament for that. We have homemade ornaments too. I bought Restoration Hardware photo frame ornaments and put photos of Husband and I as our Renaissance festival characters because we needed more ornaments to fill the tree at the time. They are still a favorite. This is Husband as the Lord Mayor. 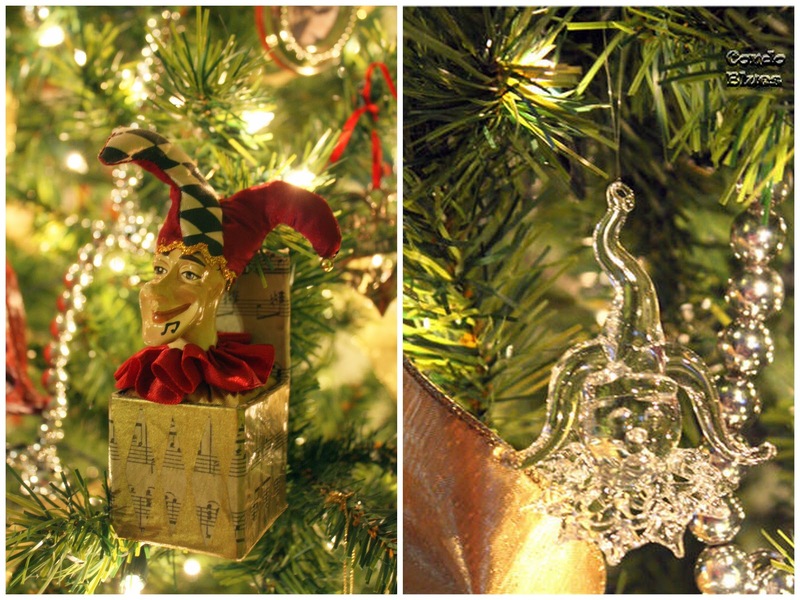 Every family member has a Christmas ornament or two. 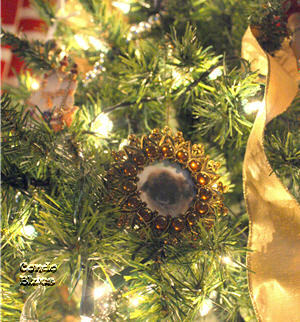 We hung Blitzkrieg's ornaments on the tree to remember him and how much he liked the holidays. Husband and I bought several bags of dog food and donated them to the pet food pantry in Blitzkrieg's name as part of our holiday celebration. Every ornament on our Christmas tree tells a story and I love it. What can I say? I'm a sentimental softy. 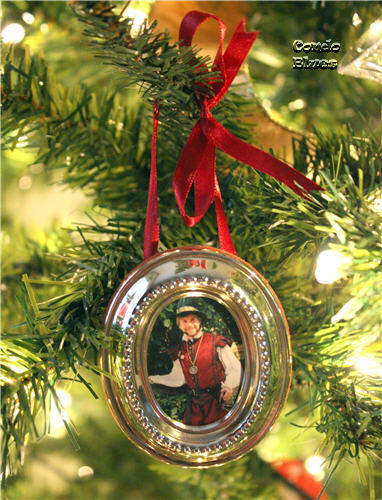 Your Christmas tree looks sumptuous - a veritable feast for the eyes ;) And the ornament with Blitzkrieg's photo is so sweet.